More great news for CQUni - or should I say our graduates? Some more great news overnight that CQUniversity graduates are once again ahead of the pack when it comes to gaining full-time employment after completing their studies. In fact, CQUniversity degrees have been confirmed as among the most valuable in Australia, with the latest national data once again showing CQUniversity’s graduate employability well ahead of the national average. CQUniversity bachelor degree graduates had an overall full-time employment rate of 79.6 per cent in 2014, more than 10 percentage points above the national average of just 68.8 per cent. The new data from Graduate Careers Australia (GCA) looks at whether Australian graduates who completed their studies in 2014 had found full-time work within four months of completing their degree. CQUniversity always performs well in this survey but I actually think it's remarkable that for the past four years running CQUniversity's results have surpassed the national average by 10 percentage points or more! The results show that in particular, CQUniversity graduates in the fields of Building, Business Studies, Education and Health were comprehensively outperforming their counterparts at other universities. A whopping 95 per cent of CQUniversity's Building graduates, across programs including Building Design, Construction Management, and Building Surveying, had found a full-time job in that timeframe – almost 15 percentage points ahead of the national average. CQUniversity’s Education graduates were even further ahead of the field, with 92.7 percent of graduates landing a full-time job – more than 20 percentage points above of the national average. And our engineering graduates are still finding employment, at a very high rate, despite the recent downturn in the mining industry. CQUniversity has grown steadily to become the largest and fastest growing university based in regional Australia. We now have more students than at any other time in our history, and we are going to tremendous lengths to ensure they are among the most work-ready graduates in the nation. The latest data really validates what our communities have been telling us – that our massive investment in new course offerings and facilities in years gone by is having a positive effect on workforce skills shortages. We really are fueling our local economies by turning out large numbers of highly skilled, incredibly well sought-after graduates year after year. What's more these results sit in perfect harmony with other recently released national data from the Commonwealth’s Quality Indicators for Teaching and Learning which show CQUniversity in the top five Australian universities for graduate employment and median graduate salaries, and ahead of the large sandstone universities for student support. These results prove that CQUniversity is increasingly becoming known as a premier work-ready university. It’s been a good year for CQUniversity (and our graduates)! Today is the International Day of People with a Disability – an important day to recognise the strength and ability of those living with disability. In particular I’d like to recognise the significant achievements and contribution our staff and students with a disability, make to this university and their communities. CQUniversity is known as an inclusive university because we understand that disability does not impact someone’s ability to study and be who they want to be. It’s because of this that CQUniversity has one of the highest ratios of students with a disability – something all of us at CQUniversity are very proud of. Along with our staff and students with a disability who inspire us every day, we also have a fantastic team of accessibility support officers who work with our students to ensure the University is offering an inclusive and supportive learning environment. This is one of the key services our student success centres delivers and is vital component of the overall student experience. Today and tomorrow the University’s Mackay campus will also be hosting the Queensland Disability Liaison Officer’s Conference. This event will bring together disability support experts from universities across Queensland, to share experiences, ideas and knowledge, with a view to bring about best practice and innovative service delivery. In particular the conference’s theme ‘Exploring perspectives on responding to diversity’ will cover a range of discussions and topics including resources, apps and web tools for students with disability, how to provide support to students with disabilities and interactive sessions. I look forward to finding out more about the learnings from this conference and continuing to work with our fantastic staff and students, to ensure CQUniversity maintains its position as an inclusive and accessible place to study and work. Some great news overnight, with a CQUniversity team once again winning the national Big Idea, social innovation competition, in the hotly contented postgraduate division. This achievement means that a CQUniversity team has now been triumphant two years in a row (last year three undergraduate engineering students won for ‘The Shelter Project’). The winning team this year was made up of Adelaide-based postgraduate students Elisha Vlaholias and Tessa Beneviste, their project was named The Garden of Earthly Delights. The project, if taken to fruition, would see part of Adelaide’s Southern parklands transformed into a community garden that provides flexible and transitional employment, education and training for people experiencing homelessness. The project would be grounded in the ethics of permaculture, earth care, people care and fair share and would be associated with CQUni’s new permaculture program. 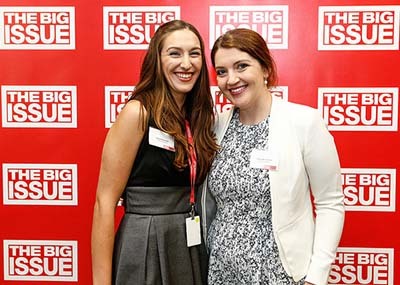 The Big Idea competition is co-ordinated by The Big Issue - an independent, not-for-profit organisation that delivers solutions to help homeless, marginalised and disadvantaged people to positively change their lives. The Big Idea is a social enterprise planning competition for university students that seeks to find new social enterprise ideas that can deliver benefits to society both in Australia and abroad. With social innovation being one of CQUniversity’s five pillars of greatness, this is extremely exciting news for the whole university, showing that we are not just a university that gives back but also a university that inspires our students to become change makers. Congratulations to Elisha and Tessa on this fantastic achievement! Credit must also go to the many staff who coached them during the development and presentation of this project, in particular Melbourne Associate Vice-Chancellor Lara Carton who has been instrumental in getting CQUniversity involved with the Big Idea and working with our students to ensure their success. To find out more about The Garden of Earthly Delights please click here. Our winners Elisha and Tessa. Well done!